By combining field-proven design of application-specific sensors with the new Sencom 4.0 philosophy and functionality, performance is guaranteed throughout the lifecycle of the process measurement, even in the dirtiest applications. This allows organisations the flexibility to adapt to changing industry requirements. Liquid analysers are utilised in a wide range of industries, including power, water and wastewater treatment, semiconductors, food, pharmaceuticals, iron and steel, pulp and paper, petrochemicals and chemicals. There are two basic types of transmitter: the 4-wire devices with separate cables for power supply and output, and the 2-wire devices that use the same cable for power supply and output. Yokogawa supplies both. 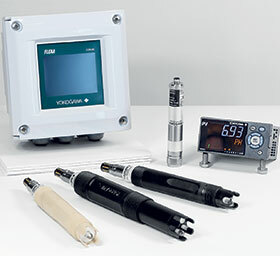 Yokogawa’s 4-wire transmitters are typically used for specific applications, such as pH measurement, and the FLXA21 and FLXA202 2-wire transmitters can flexibly accommodate multiple sensors of the four basic types: pH/ORP, conductivity, inductive conductivity and dissolved oxygen. Although the FLXA402 is a 4-wire system, it can connect to multiple sensors, perform diagnostics and communicate digitally with host systems. To facilitate optimal processes and improve efficiency of personnel, Yokogawa has placed a strong focus on its digital smart sensor Sencom 4.0 platform. Following the commitment to co-innovation, this generation of process control solutions was realised in collaboration with customers. Sencom 4.0 combines measurement, control and information for a more connected solution. The new liquid analyser platform provides full visualisation, while improving the operation and reliability of online process analysers. It utilises the latest sensing technology and asset management tools in order to give users the power to see more and do more. This instrument can work with existing analog sensors (pH/ORP, conductivity, inductive conductivity, and dissolved oxygen) and optical dissolved oxygen sensors, as well as the SA11 Sencom smart adaptor and its dedicated sensors. By combining with the SA11 adaptor and the BA11 junction box, it is possible to connect up to five sensors, which reduces both system cost and footprint. HART7 and Modbus protocols are supported for the transfer of diagnostic data and other device information to a host system. Connection to the cloud is also facilitated and therefore the construction of an IIoT environment for improved field maintenance. The adaptor has functions for data conversion, transmission, calibration, and diagnosis, and is intended for use with dedicated sensors. It supports the Modbus communications protocol, and in addition, can connect directly to the UM33A-S digital indicator; the FieldMate versatile device management software; as well as control systems, recorders and indicators that support the Modbus communication protocol. The SA11 also has the ability to store sensor calibration data and other types of digital information, which can then be transferred to a laboratory or other remote location. This reduces the amount of maintenance work that needs to be performed in the field and helps to ensure that the device stays properly calibrated, thus reducing downtime. Maintenance and calibration in the field can easily take half an hour per measurement on a monthly or bi-weekly basis. With more equipment to maintain, the Sencom 4.0 platform utilises the integrated hot swap and plug-and-play functionality, which significantly decreases downtime. The Process Guard and Maintenance Manager functions allow users to predict maintenance checks and sensor replacement. Since the sensors are pre-calibrated, they can simply be changed using the plug-and-play ideology. When the sensor is connected to the analyser in the field, the latest calibration data will automatically be uploaded making calibration in the field unnecessary. This significantly simplifies maintenance and service. To avoid unexpected failures, the Process Guard diagnostics provide users with an immediate indication as to whether there is a problem. Tracking sensor impedance readings provides users with the ability to detect early pH sensor coating or polarisation of a conductivity sensor, before there is measurement failure. The data-logging function provides total process analysis by showing the measured data before, during and after an event has occurred, while sensor wellness functionality enables proactive maintenance by predicting maintenance checks and in severe circumstances, sensor replacement. Industrial automation is moving towards smart products, with sensors changing from analog to digital. This transition can affect plant operations and take time to implement. With the new Yokogawa Sencom 4.0 platform, upgrading to next generation product is easy, and an upgrade transfer can be done at any time with little impact on operations. The platform accelerates time-to-value of the new technology and provides the flexibility to move data and workloads on an ongoing basis. In future, it will give more insight into total measurement solutions and will enable enhanced capabilities such as cloud connect and data mobility, thereby providing more credible data through the entire lifecycle of a product. Yokogawa’s Sencom 4.0 platform will be released in South Africa in early 2019.